Sega is bringing back its beloved Dreamcast this fall—or at least two of its more memorable games, in downloadable form—but what of its predecessor, the sometimes spectacular but relatively unsuccessful Sega Saturn? Sega has not forgotten it. The Dreamcast returns this fall... sort of. In fact, Sega is "thinking about ports of Saturn games" for future releases. 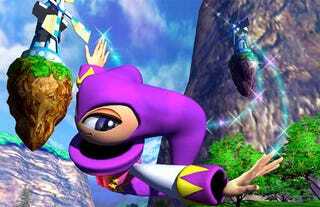 It has already ported a handful of Saturn era titles to the PlayStation 2—Nights Into Dreams, Panzer Dragoon, Last Bronx, etc.—but it may abide fan wishes for more recent retro remakes. "What we announced this time is a project where we will have consecutive releases of titles that were debuted on Dreamcast," Sega producer Yosuke Okunari told Impress Watch, as translated by Andriasang. "Separate from this, we're of course thinking about ports of Saturn games. It's the same as how Sega Ages and Virtual Console were separate existences. It's not that we have no intention of porting Saturn titles, so please share your requests." We've already made our selfish wishes for Sega's next batch of downloadable Dreamcast games, but if they're going to give us an inch, we're going to take a yard.